Another week and another room I am sharing! 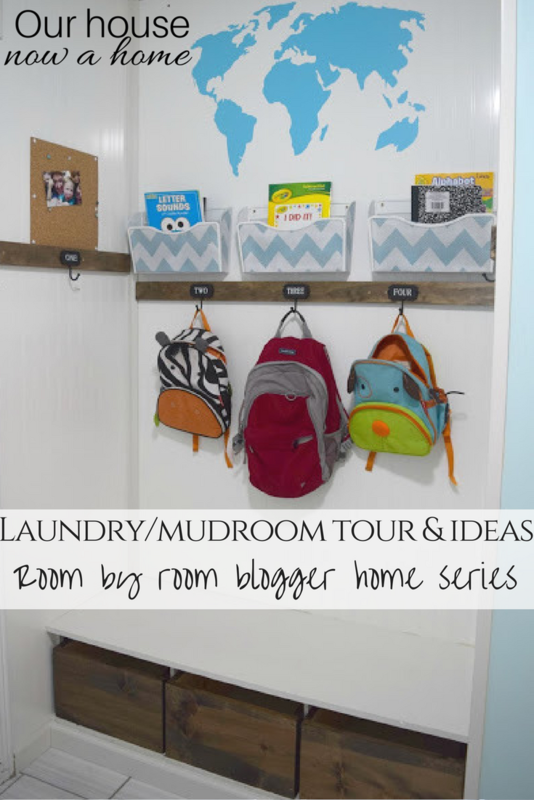 Today is all about the Laundry and mudroom tour and ideas – Room By Room series week 7. 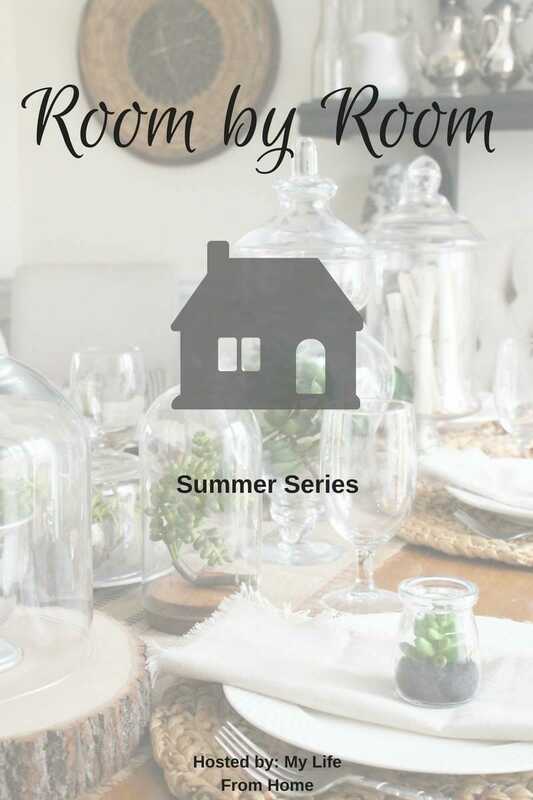 Over the course of the summer myself and a group of bloggers have been going room by room, sharing the details, reveals, or plans for specific rooms. Most of them are pretty after pictures with tons of ideas. Today, with me sharing my laundry room and mudroom this is not the case. So, this is not going to be the most inspirational post, I will leave that to the other lovely rooms by my blogger friends shared at the bottom of this post. Our laundry room is the first room we walk into from the garage, and that room opens into the long hallway. I added a mudroom nook to this space two years ago and love the results as far as functionality! I also made a barn door, tiled and added some upper cabinets in here. 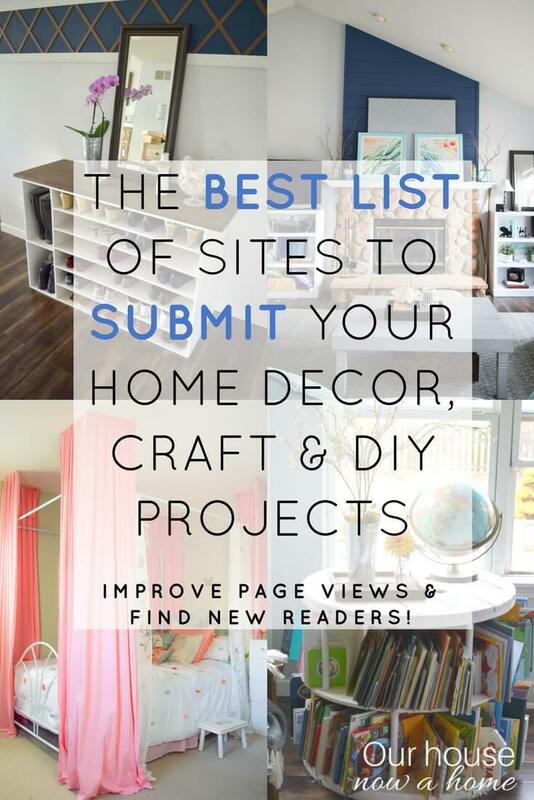 All DIY projects in this room will be shared with full links at the bottom of this post. I want to apologize for the lack of any wide shots of this room. Look, summer happened, my kids are home all day, clothes are getting dirtied at an alarming rate, and I am barely holding on. A shiny and picture ready laundry room was not happening. 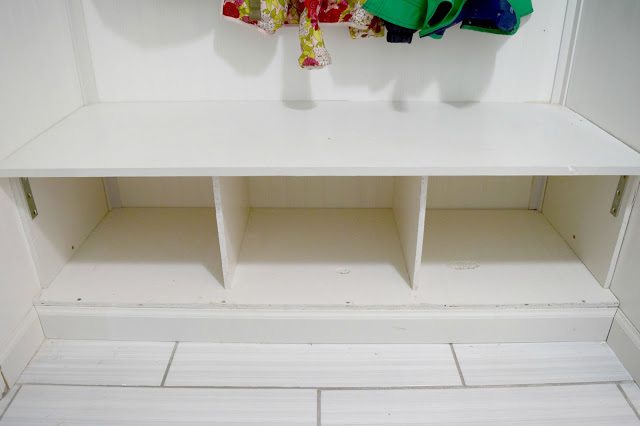 I hope to update this post once I have a cleaned up laundry room. Wich me good luck in getting that to happen! Here is where things will get real, I am not 100% happy with the mudroom space. It functions great to hold my kids backpacks and their homework. How I envisioned they would use this space is not how it is being used though. 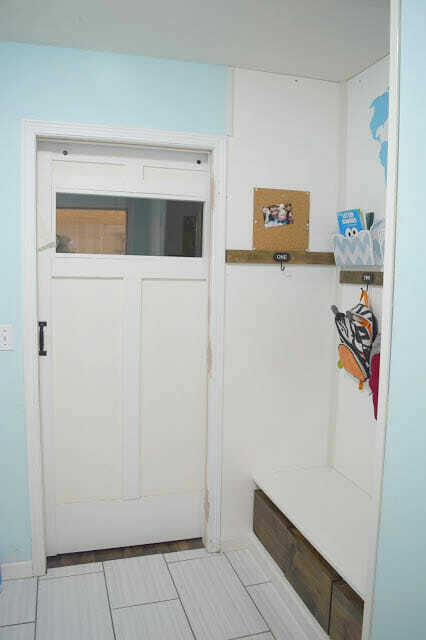 So I am planning on revising this mudroom, or as we call it “the organization station”. Let this be proof that I am far from a professional decorator and do make mistakes as well. 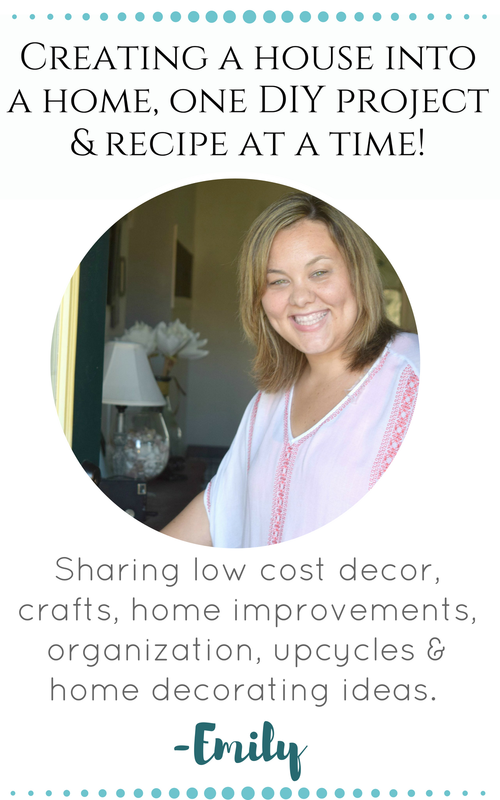 Life happens, my style changes, our needs change slightly and I am left with a mudroom/laundry room that is not quite right in terms of style or function. Even after tweaking portions of it. I am not there yet, and will be correcting these mishaps. When I planned for this nook I figured my kids would sit here and put on their shoes or snow gear. No matter how many times I have tried to encourage this, it does not happen. I had initially wanted to make this into three narrow cubbies or lockers with storage on top and multiple hooks per kid. But with the smaller space here it would limit the bench use. My kids don’t use the bench anyways. Add three tall lockers from the bench all the way up to the ceiling. Giving me tons of storage! The one thing I will be keeping is the practice of having a place for my kids to put their nightly and/or weekly homework. 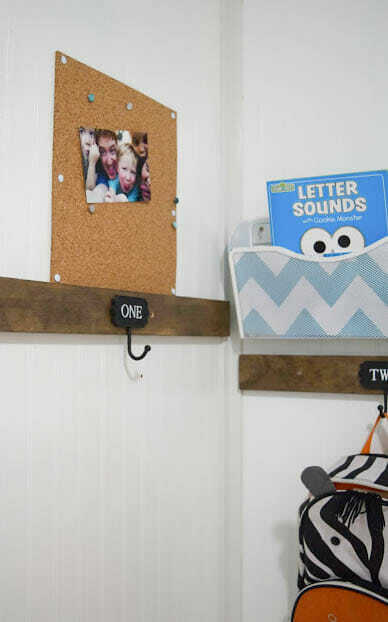 These little wall organizers have helped so much in keeping things organized. I am sure it also prevented a lot of lost homework assignments. The thing I will be changing is the style of the room, I like elements of a farmhouse feel. But once this final look was done, it felt very country to me. I want to clean up the lines, colors, and soften it all. The stark light colors with the dark wood tones feels overwhelming for this very small room. Let’s be real, this is a laundry room and mudroom, which with the best of efforts will never be completely picked up. It is chaos central, and also the main entryway into the home we use from the garage. I want to soften this room, add a ton of usable storage and minimize the decor. Keeping things simple is the best for a space like this. We built the boxes for their shoes to go in. All of my kids shoes are kept here. I found myself asking them to move them from the floor of the laundry room (where they threw them off when walking in the door), putting them in these boxes. Then asking them to move the same shoes into their closets. I cut out one step and their shoes are all stored in here. This will be staying the same because the system works perfectly for us right now. I know when my kids get bigger feet all of their shoes fitting here will not be possible. For now I have small kids with tiny feet and it is a happy shoe storage set-up. The laundry room side of it…. where do I even start? I was all for getting this room to function better. 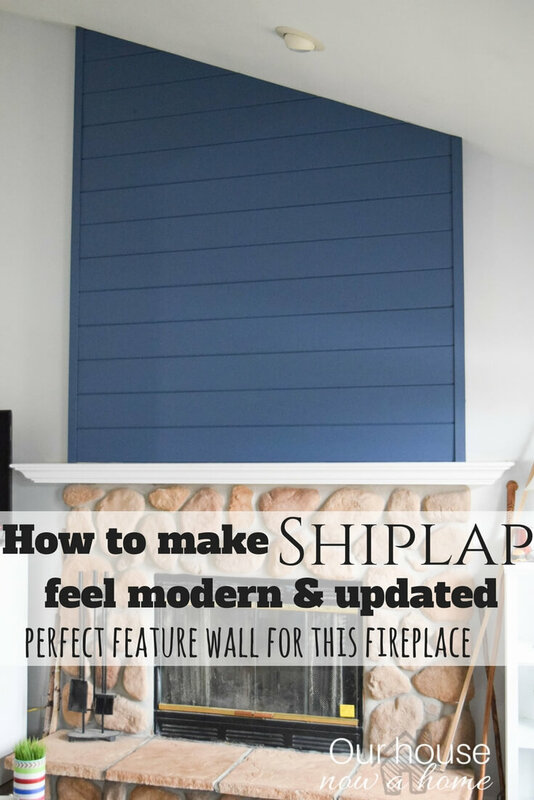 As anyone that frequently reads this blog knows that I LOVE adding function to my home. 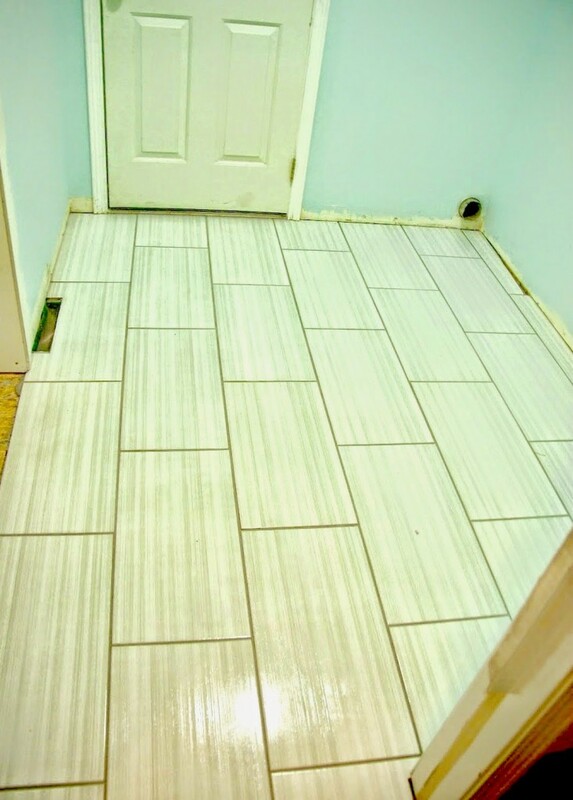 But, once I put new tile down, this room became usable again, so the heat to get it done was off. But, I have decided to tackle this again! So there you have it, the good, the bad, and the ill-planned out Laundry and mudroom tour and ideas – Room By Room series week 7. People always ask me how I can still have rooms to decorate and content to write about. This room is proof of that. Yes, it works, technically. I want to improve the function, storage, and of course there is a ton to improve upon in terms of style to. Taking it from basic to “wow”. This is the secondary entrance into our home, and in winter this is the entrance people use a lot, leaving their winter boots in the garage. Time to up the pretty in this tired and forgotten room! 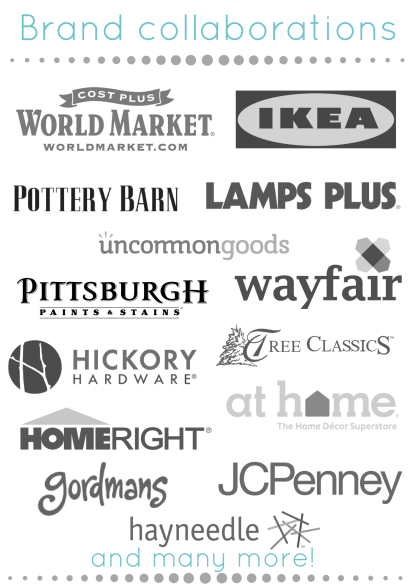 The laundry and mudroom are two areas that I researched on over and over but have not yet figured out what to do. Thank you for all the great ideas! 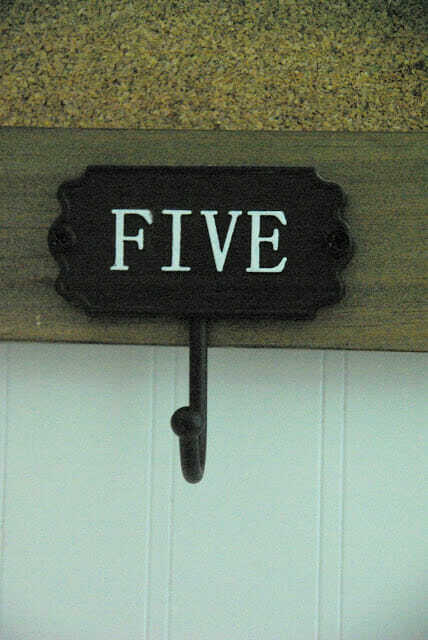 I love the hooks with numbers on them. Now, if the children could just follow directions and hang everything up themselves, that would be great. Haha. I love that backpack area. We don’t have a laundry room. In fact, our washer and dryer are down in the basement. Backpacks get thrown on the floor in the kitchen…. Wish I had some of these ideas when my kids were young and still at home. Love every single one of these ideas. Back packs hung up and out of the way and the board is great for know what is going on. That calendar is AMAZING – I bet it takes some time to keep up – it looks so neat! 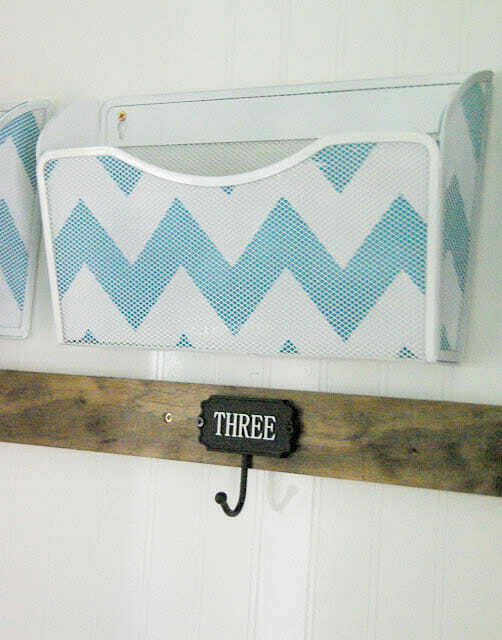 Those baskets mounted on the wall are a fantastic idea as well! It looks like you planned out that area so well, a shame it isn’t quite used how you thought it would be, but hey in time it might! You are so organised. I am loving the Organization Station. 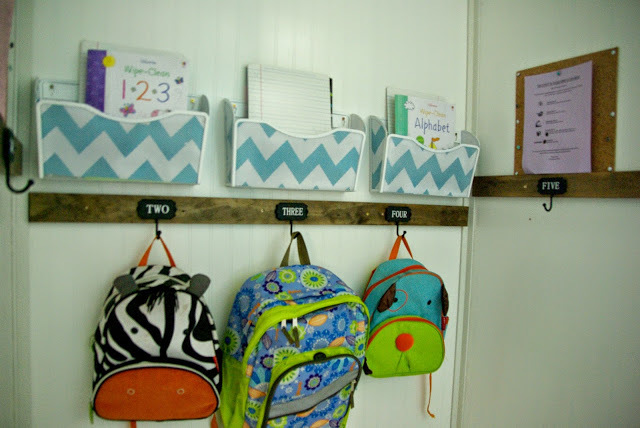 What a great way to teach kids organizational skills which will definitely come in handy as they get older. It looks AMAZING! 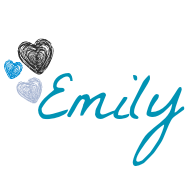 This looks great Emily, I love how you packed a lot of storage into the space! That’s so cute!! The storage and organization looks fantastic. I love your style! It is so clean and classy. I really wish I had a mud room so that the backpacks and snow covered boots wouldn’t be thrown into the front hallway. I like how you have the boxes for storing shoes. That seems like a simple solution to make sure they are` where they need to be. 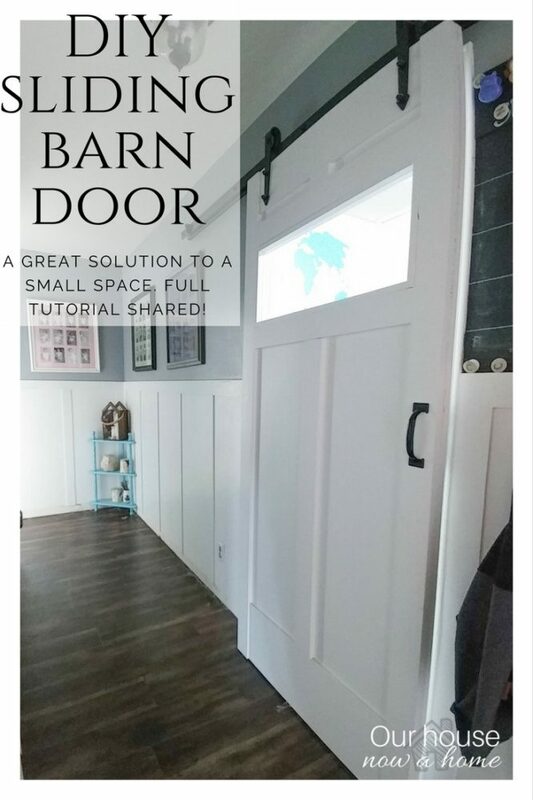 I love how you can transform even a laundry/mudroom into an amazing space! The organizational ideas are fantastic, and everything looks so warm and welcoming! What I would do for a mudroom and laundry room like your beautifully organized space! NYC equates to super tight spaces for most of us and I’ve always dreamed of a proper place to store the shoes, backpacks and more and tackle the laundry,. 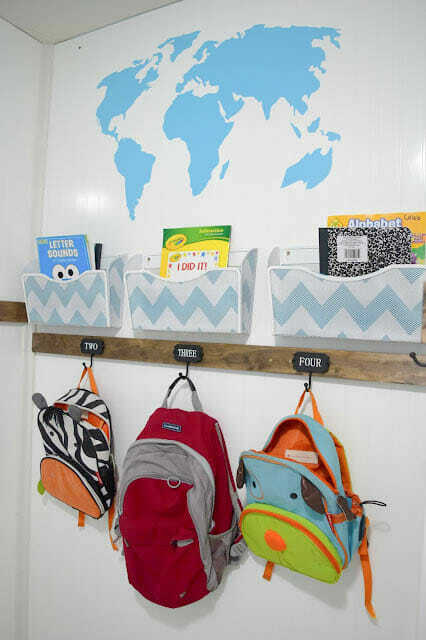 The hooks and bins are brilliant. 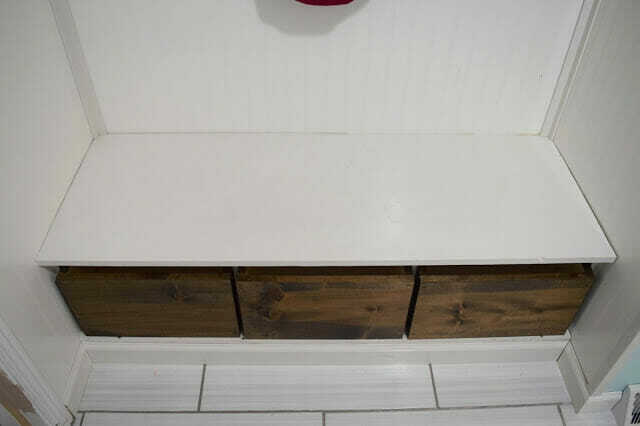 Your new ideas will probably help keep your house so much cleaner and more organized. I wish we had the right kind of space for shoe storage like that. It looks great! You definitely created a functional and organized space. I love it. It sounds like you have it all planned out pretty thoroughly. I’ve never seen lockers in a house before, it’s an interesting idea. I’m really digging the shoe storage boxes. I really need to do something like that. Our shoes are such a mess. 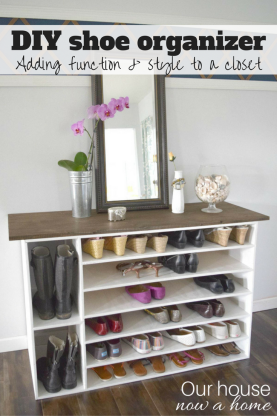 I absolutely love how you have your mudroom organized. Right now my boys are a bit too short to reach the shelving which means our mud room gets messy. Ugh. Love this! I want to remodel our laundry room so I enjoyed reading your post! I love your project! I so want to remodel our laundry room so I enjoyed your post! I can’t wait to see it when it’s completed. 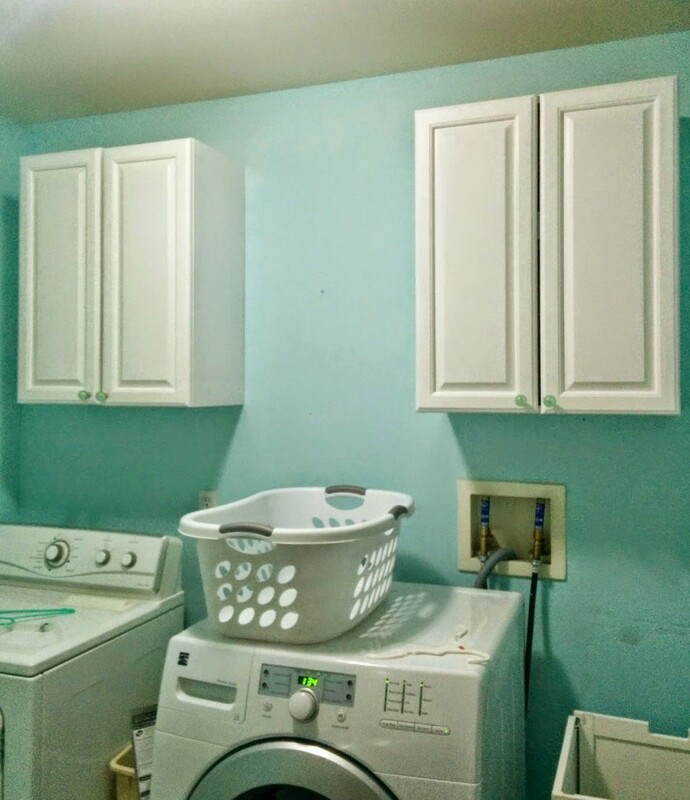 My laundry room is in desparate need of a makeover. I just don’t know what I want to do with it yet. I defintely loved some of these ideas. I love how organized this is and how pretty it is too. It is nice to be able to have a place for everything, I am all about getting it all put away at the end of the day. Yes, I wish I had these ideas as well when my kids were young. I love the backpack idea! 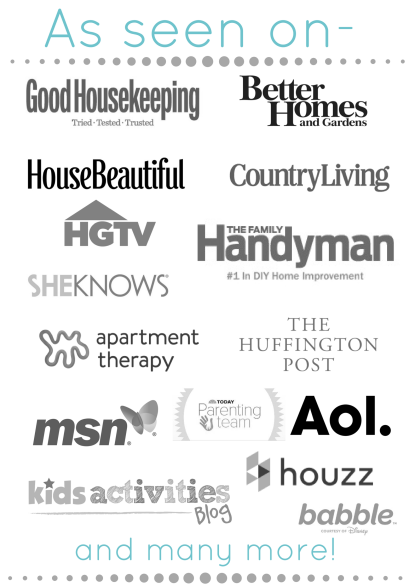 I love this, this is the type of organization I was all over my home. My kids aren’t tiny anymore but this would be perfect for our no shoes policy. I bet it feels so good to get organized!! Love the hanging file baskets for books. I used to do something like that for incoming mail and magazines. Always too much junk mail. I was’t aware that laundry/mudroom can be so creative. Nice post. Really great space! My goal is to keep all my kids homework organized in baskets. Lets hope it will happen! 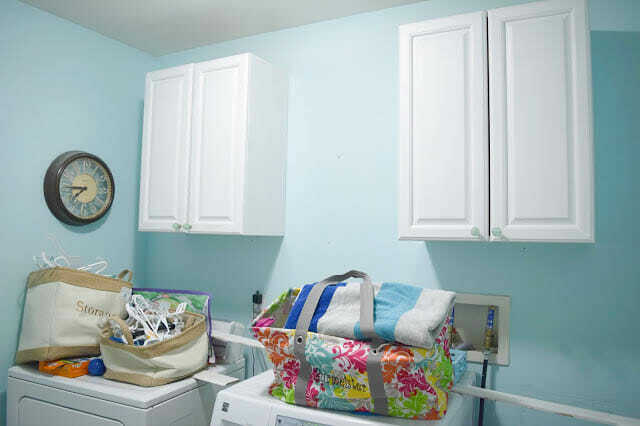 Love the plans for your laundry room! I LOVE the bench seat! It’s so cute! This is a great space – honestly I need a great laundry space otherwise I do NOT want to do laundry haha! These are all great inspiration ideas! I love the hanging baskets below the calendar! You have a lot of great organization items. This came out just beautiful. I so love the color. I wish out laundry room was big enough to do this. Your mudroom/laundry room looks a whole lot better than mine. I thought I could get things more organized in here now that the kids are older. Oh no. I was so wrong. I think the idea of putting hooks and storage boxes for shoes will be a start for me. Thanks for sharing your ideas. 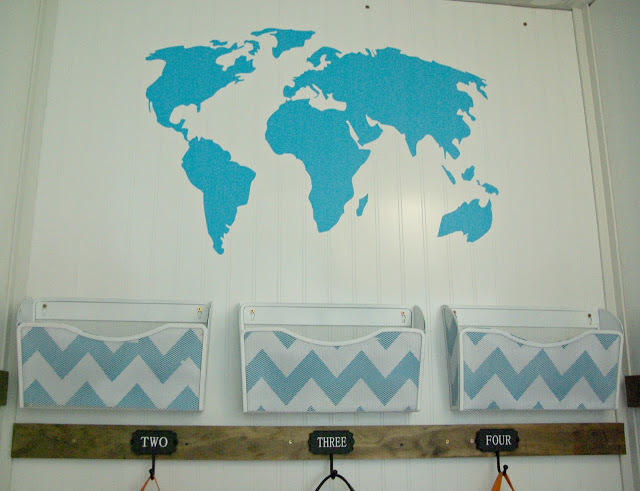 You always have the best ideas that maximize the space – especially with your kids in mind. Great ideas! 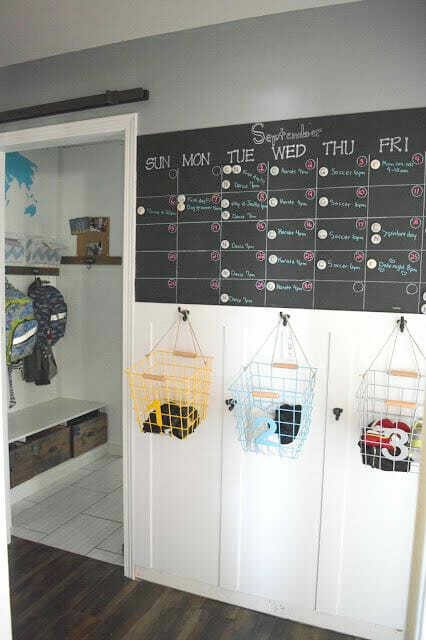 I really like the wall system you have for hanging up backpacks and homework – so smart! This looks so lovely. 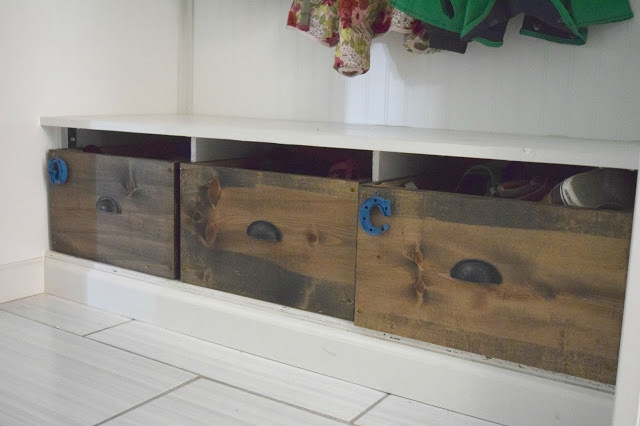 Great ideas for laundry and mudroom.